We’re so glad you’re here to join us as we kick off the new product introductions for this month! We’re looking forward to Easter and Spring with projects bursting with blooming, pastel goodness. You’ll also get your first look at the debut set from Jennifer Campbell, our newest product designer, and you’re going to be head over heels! Penned Elegance is a stylish set of modern, hand-lettered calligraphy sentiments. There are a wide variety of sentiments for so many occasions and moments in life. Hand lettering allows you to add that special, personal touch to all of your cards. Bold Borders: Blooming is the first in a monthly series of dies. This stylish, wide frame features a delicate floral pattern that pairs beautifully with the sentiments you already have in your collection. Included with this frame is a large-scale “hello” sentiment die that you can use with the Bold Borders: Blooming frame or on its own. 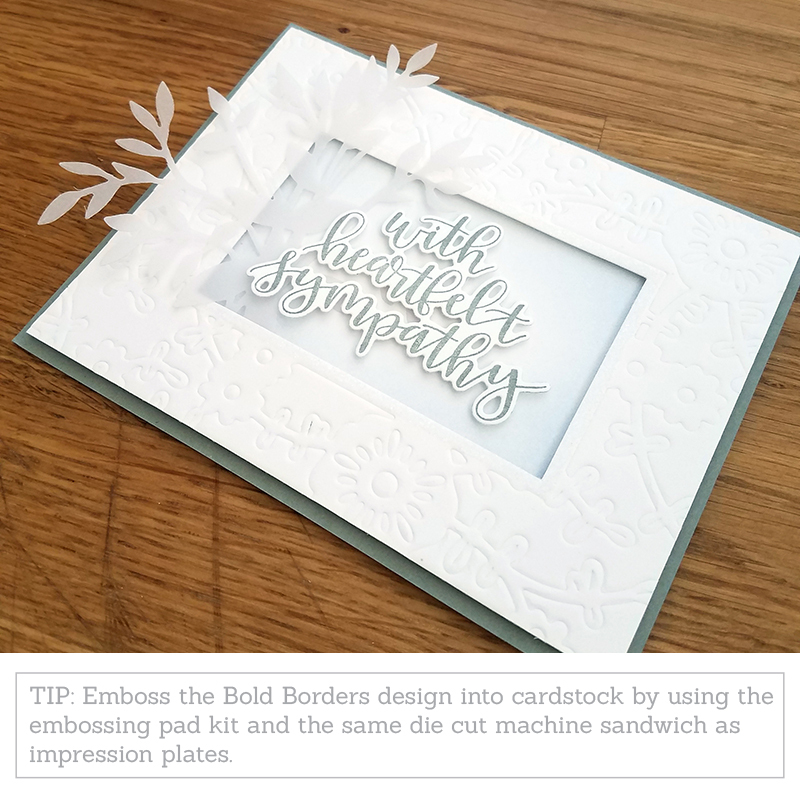 You’ll love how easy is it to create gorgeous in a snap with this elegant die cut frame and a simple stamped sentiment. A sweet set for Easter that features a bunny, a butterfly, flowers, and egg designs. 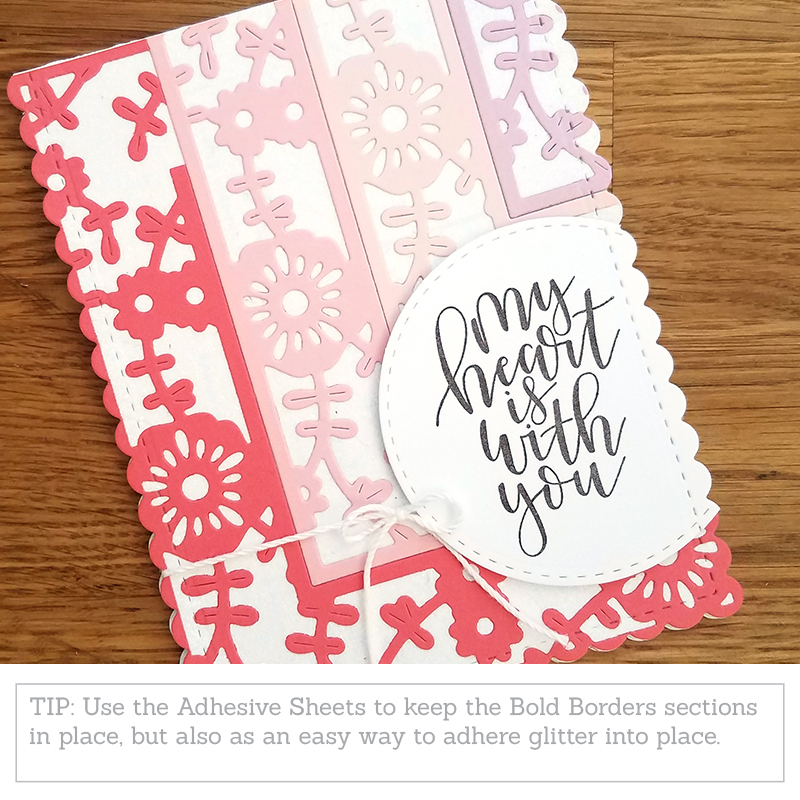 You are going to love the outline and solid image options and how they will bring your cards, tags, and other projects to life for the spring season. 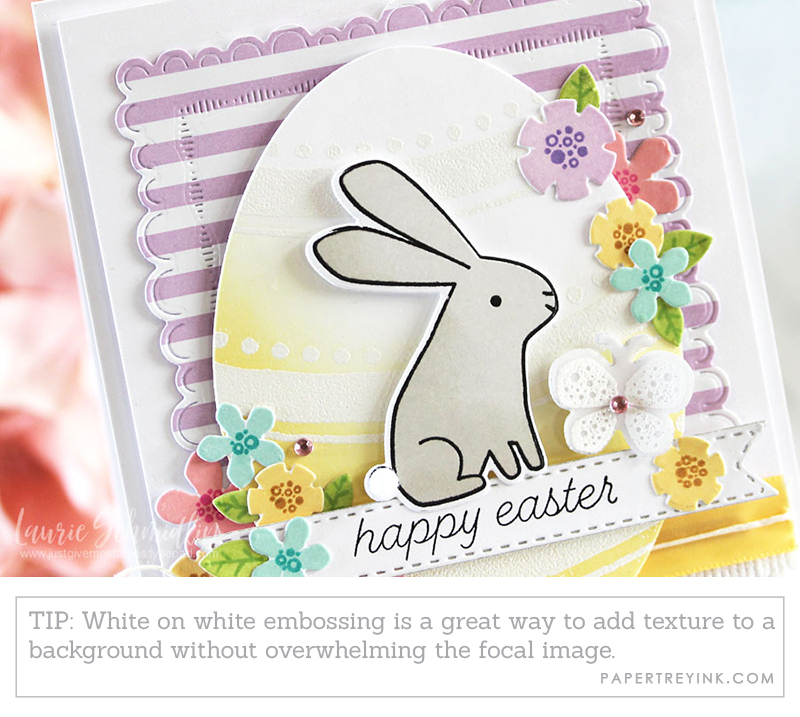 Use the Bunny Blessings dies to cut out the images in the Bunny Blessing stamp set. The egg and flower dies match the stamp set images exactly so that the detail stamps in the set work perfectly with the die cuts. A bit more is just that! This set has just a bit more to compliment the Bunny Blessings set. 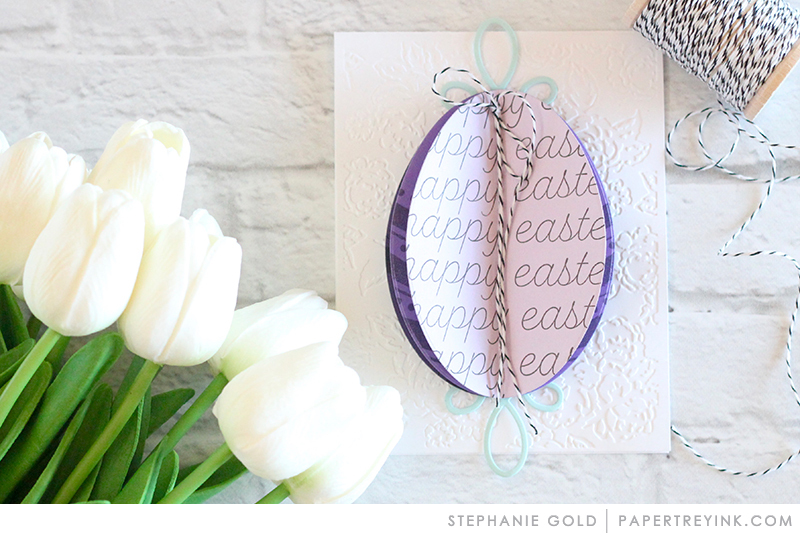 It includes sentiments in a larger size and smaller versions of the bunny and easter egg shapes. This big egg shape is going to be a great addition to your paper crafting supplies for Easter and spring projects. The size is perfect for a card front or a larger size tag perfect for decorating basket and gifts. Easter is on it’s way and it’s time to decorate eggs! This coordinates with the Big Egg die to make adding stripes, zig zags, and dots a breeze. Lizzie paired watercolor and ink blending on this colorful project. The ink splatters in the background add texture and interest without competing with the flowers and vines in the Bold Borders die. Using the Bold Borders die as an impression plate gives it a much more delicate, understated appearance. The vellum die cut Lizzie used gives her project an even airier feel. Using pale blending on the lower layer gives it subtle definition that sets it apart without distracting from the beautifully hand-drawn sentiment. Nesting sections of the Bold Borders die like Lizzie has on this card creates such a fun, unique layout! She used glitter in the negative spaces to give her card front plenty of sparkle and shine. 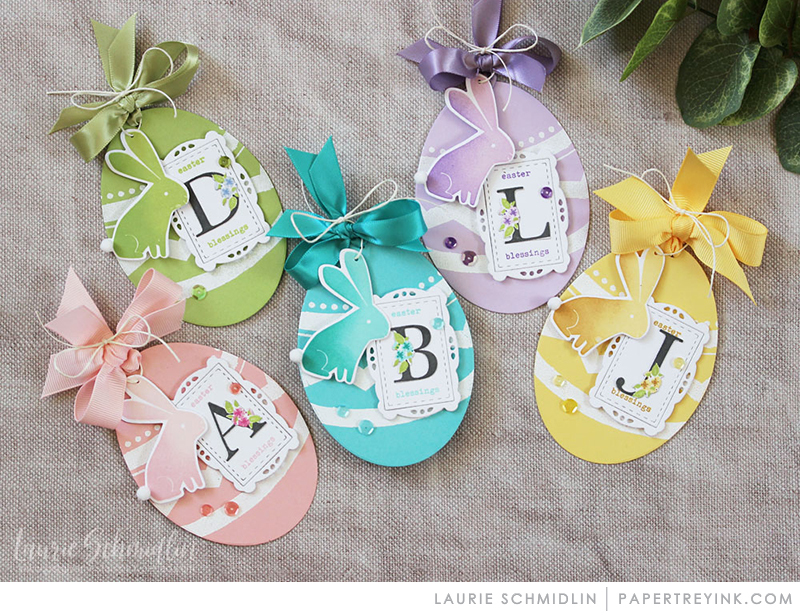 Laurie’s charming monogrammed Easter tags are almost too cute for words! The embossed white stripes are a wonderful contrast against the colorful eggs. And the bunnies are absolute perfection with their shading and pom-pom tails. 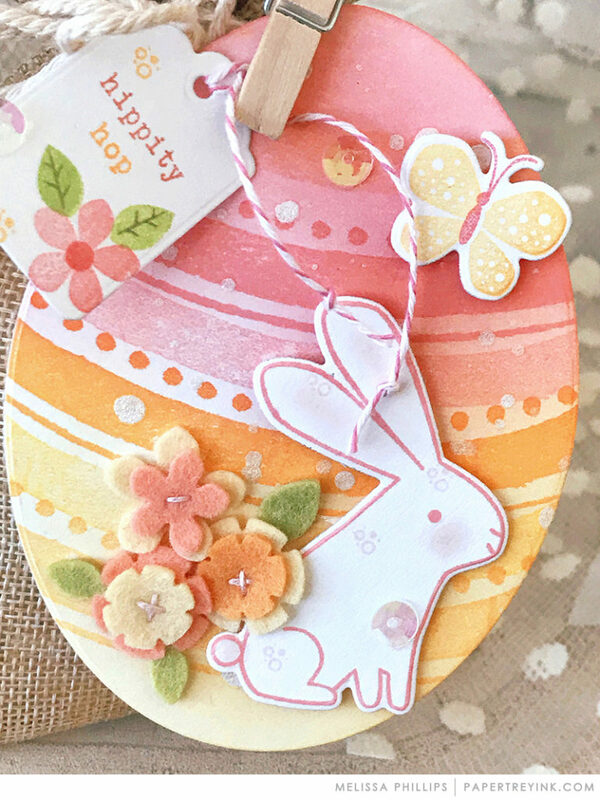 Laurie cleverly used the Big Egg Die to create the focal point mat for her bunny. She added so much wonderful, spring color with her clusters of flowers and the pom-pom trim is a fabulous way to repeat the texture of the bunny’s tail. Her use of dimension and depth makes this card something truly special. 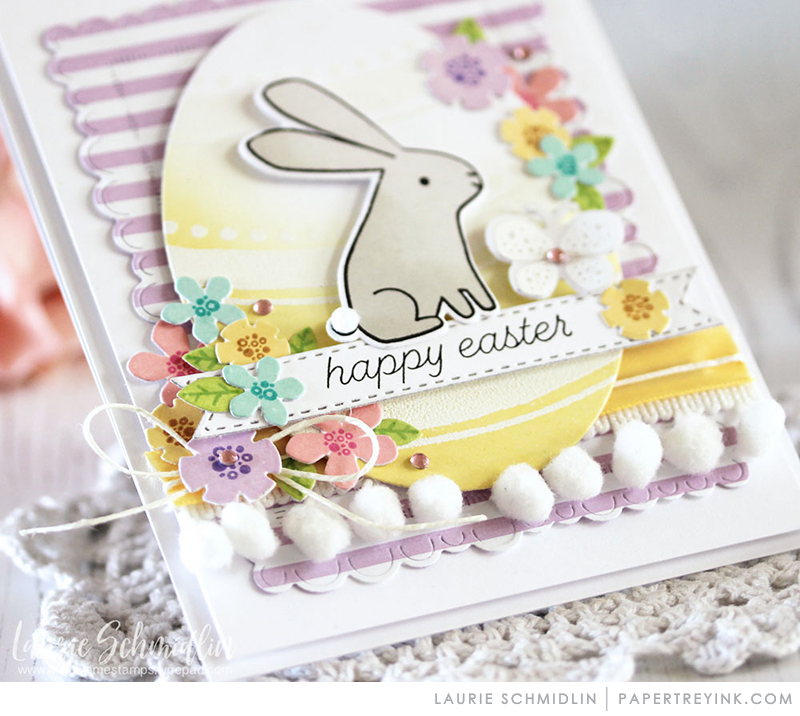 Everyone loves an interactive card and Laurie’s pocket tag card is sure to delight! A simple tug of the tag reveals the bunny’s hidden stash of decorated eggs. Her stitched layer also adds the perfect carefree finishing touch to her background, don’t you think? I hope you have enjoyed all the creations that we have shared with you today! Doesn’t today’s post put you in the mood for warmer weather, spring flowers, and dying Easter eggs? We would love to hear your initial thoughts on everything we introduced! Please leave a comment on this post to tell us what you think of the new products and you will be eligible to win big! DO NOT count eggs that are part of the project or stamped (solid and in color). Only the white egg images will be included in the final count. Be forewarned that some photos may not have any eggs hidden within them and others may feature as many as four! Once completed, calculate your final grand total and add your official entry to the comments section of this post! 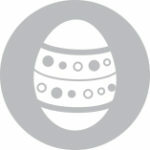 Each of the Design Team members posting project today will have an “official egg hunt” photo on their personal blog posts with anywhere from 0-4 eggs hidden in it. Go to each of the posts and count up the number of eggs that you can find hidden in the photos. Enter your guess for the total number of eggs hidden in the projects of the design team members posting projects today in the comments section. You will have until 6am ET, Thursday, February 15th to add your comment to be eligible for the contest. Two randomly selected winners will be chosen from ALL OF THE CORRECT ENTRIES on Friday, February 15th. Tune into our Release Party Live broadcast on our Papertrey Ink Facebook page where the winner from this challenge will be announced! Winners will then be posted on our February 2018 Winners Page. Two randomly selected winners will get a $100 PTI gift certificate to spend however they like! 11th Anniversary Day 5: 2018 Retirement List + February Sneak Peeks + 2 Challenges! I counted 12 eggs in total. Keeway is the only one who didn’t have any. I counted 16 eggs in total! Very fun and great inspiration today! I counted 16. All of the projects are beautiful! I counted 16 eggs in the hunt!! What a fun challenge ❤️ I love all the beautiful stamped Easter eggs! I found 16 eggs. Love this every year. I found 16 as well. My count was 16 eggs! Some of them were very well hidden, too 🙂 Beautiful Spring inspiration from all the design team. Love the variety of stripe decorations for the Big Egg! My eyes are a little cross-eyed as I need to get them checked but it was fun. Hope I found them all – 9 !! Spring and all the glorious color it brings to the cards. I have old cataract -developing eyes, but believe I spied 16. 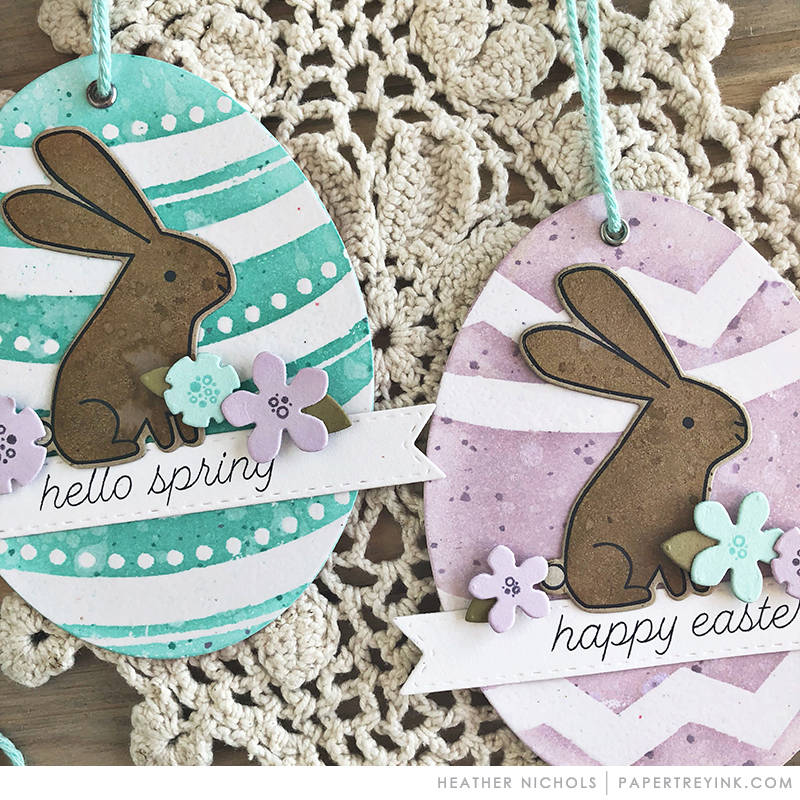 Beautiful cards & tags for the Easter season. You gals know how to tempt! Love all of the wonderful creations today! I found a total of 16 eggs. 16 is what I came up with! Lovely projects as always! I found 16 eggs (a couple were very faint!) and lots of beautiful projects. I LOVE the Penned Elegance set! Enjoyed the beautiful projects today and I found 16 eggs along the way! What beautiful projects! I love the challenge. I found 10 eggs. I counted 16 eggs as well. Some of them were rather hard to see. Anxious to see the new products. I counted 16! Some were verrry sneakily hidden! I counted 16 cleverly hidden eggs. I also spotted lots of lovely inspiration shared by everyone today! I found 16 eggs. What fun- I always enjoy this challenge! 16 eggs & a whole bunch of beautiful spring projects! 16 eggs I counted. Some were very tricky! Found 16 as well. What fun Easter things! I found 16 eggs. Love the projects! I must need new glasses– I only saw 9. Oh my, this was hard. I counted 16 eggs. I found 16 eggs. The projects today are just fantastic! Can’t wait to get my hands on Penned Elegance! Loads of Easter additions to stock up on too! So much fun! Beautiful 1st day release inspiration. I found 16 eggs total. So excited for this release! I found 16! This woke me up this morning! I counted 16. Love the Easter egg hunt!! I found a total of 16 eggs! All of today’s inspiration is spectacular!! I found 16 eggs! That was a fun egg hunt! Such fantastic inspiration from the team! Loving the egg die and the penned elegance set!! I love this challenge. I found 16 eggs. Thanks for all the beautiful inspiration. Spring can not come soon enough! I count 16 eggs. Great projects today! I found 16. Thanks this is always fun. What lovely projects! And I have found 16 well placed eggs among these photos. I can not wait for the release! I found 16 eggs! Amazing projects today! I am so ready for spring – love all the Easter goodies! Thanks for the fun and happy spring egg hunt! My tally marks add up to 16. Always love the egg hunt. I found 16 eggs. Oh my…it took a while to find Heather’s third one hidden on the doily, but I found 16! Very fun, Girls! Thanks! I found 16 in total! I count 16 eggs amongst all the beautiful projects along the way! I always love the egg hunt! I counted 16! I found 16 eggs. Some were pretty tricky to find! Beautiful projects today. Another fun hunt! I found 16! I always look forward to this contest! I counted 16 hidden eggs. Had to blow up the photos. Wow, Stephanie, you were very sneaky! I found 16 total after looking twice! Love those bunnies and eggs! I found 16 eggs – – – what fun……..
What a fun treat this morning! I found 16. Some were very sneaky (hubby didn’t do well and wasn’t much use to me ?). Loving Bunny Blessings and Penned Elegance! This challenge is always so tricky! 16 eggs? We will see! I found 16 eggs in all the lovely projects! 16! I love this challenge! This is going to be a “must have” for me! I love those little flowers with the bunny. Love this stamp and die set! 16 eggs in my basket! Love Jennifer’s new penned calligraphy! Please add that to my cart, I mean basket! 16 eggs found!! Always fun to do the bunny hunt!! I found 16 … a few of them were well hidden! I counted 16 eggs! I absolutely need the big egg die and stripe set to make basket tags!!! I counted 16 hidden eggs. Loving all the gorgeous projects! Beautiful new supplies, too. I found 16 eggs as well. Loving the Penned Elegance stamps & dies and Bold Borders die. I think there are 16. What fun! 16 eggs! And really lovely spring product with equally lovely artwork by the dt! There are 16 eggs in the hunt. Love the egg hunt! I found 16 altogether. What a FABULOUS day one of PTI’s February release! Love everything and I just loved all the designers cards/projects. Such great inspiration. I counted 16 eggs! Thanks for the fun egg hunt and super Easter inspiration. I found 16 eggs. Thanks for the chance to win! Love all of the new products introduced today! The design team’s projects are nothing short of amazing! Great job! I love the Easter Egg hunt and was really hoping you would have one this year! Yay! I just really enjoyed myself looking at all of the lovely talent and hunting, hunting! I found 16 eggs. You were very clever with your hiding; well done! I found 16 eggs. Thanks for the chance to win! I counted 16 eggs. Love the bunny in the Bunny Blessings set – such a cute little guy! I found 16 eggs! Love the new egg die and matching stamp set! I see 16 eggs 🙂 LOOOVING the big egg die and egg stripes and bunny blessings is just too-cute-for-words! Thanks PTI for another amazing chance to win!! OK, I tried. 16 eggs? Love the new frame die & glad to hear they will be a new series! Such inspiring projects today with beautiful work by the DT! I counted a total of 16 eggs! Had to double check myself as some were hard to see. Beautiful projects. Just love the little bunnies. What a variety of pretty cards! I found 16 eggs along the hop! 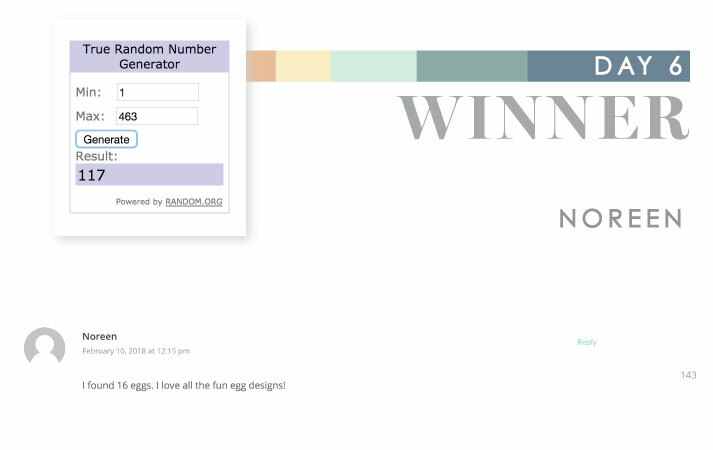 I found 16 eggs and apparently that the right number according to all of the other commenters! Happy Anniversary to all! I found 16 eggs! 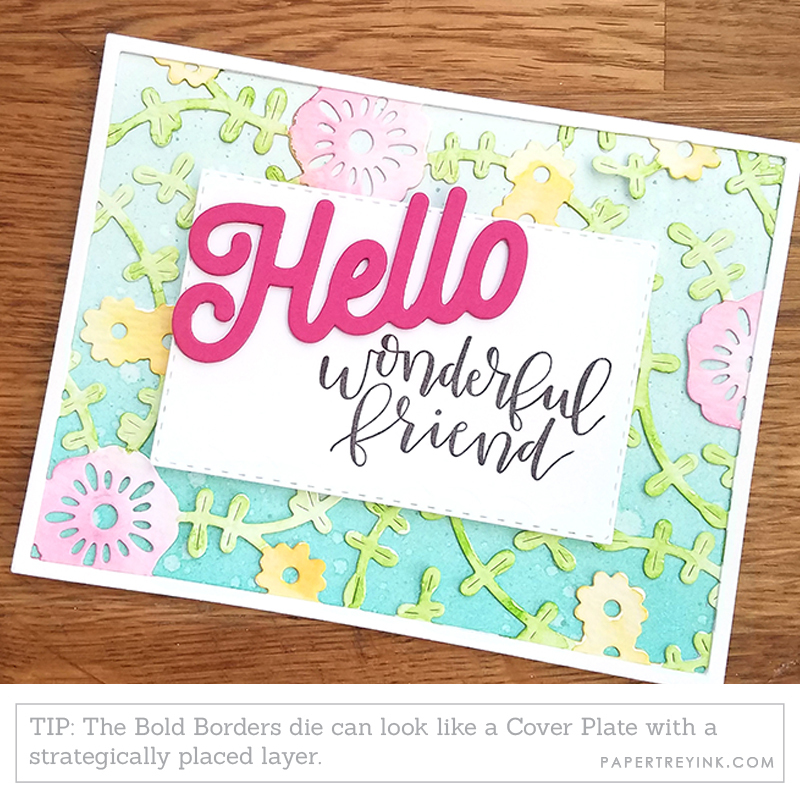 The Bold Borders is a must have die. Love it! Some of the posts I had to look at twice to find all those eggs. Fun & clever! I found 16 total. This was so much fun. I found 16 eggs. 16 eggs – beautiful projects! what a fun and beautiful start to the countdown!! I found 16 eggs after going through twice! That was fun! !6 eggs in total. I found 16 eggs! This is such a fun challenge! I came up with 16 eggs. Just love all the spring and Easter goodness today! Easter is my favorite holiday. 16 eggs found while perusing the beautiful design team work. Found 16 hidden eggs. Love all the spring goodness today! So wonderful creations today from the team! I found a total of 16 eggs. Just love the little bunnies and flowers. I found 16 hidden eggs and had a ball. Very fun!! 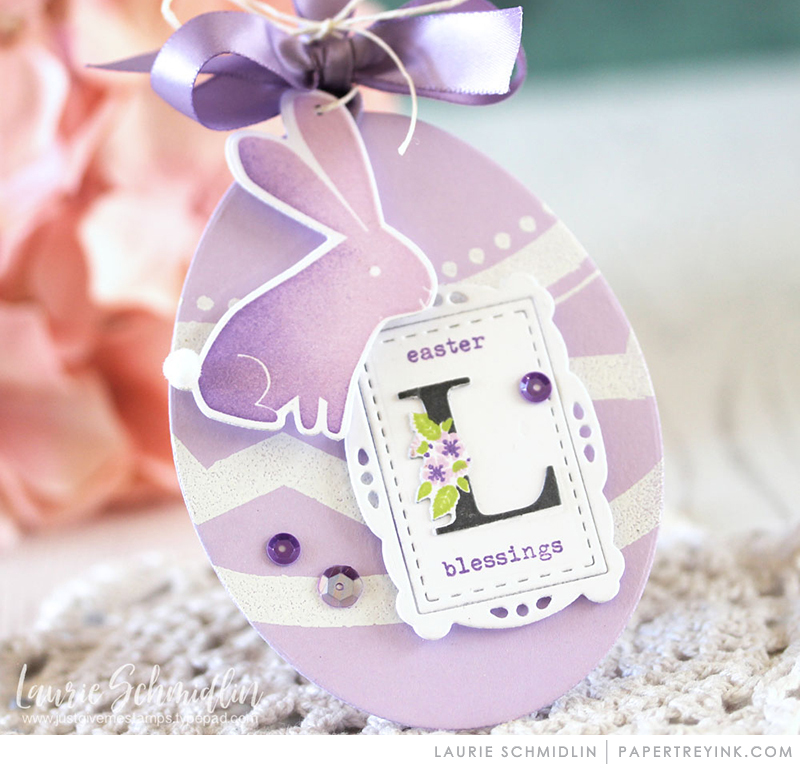 The new big egg die, Egg Stripe stamp set and Bunny Blessings really caught my eye! That was fun! I found 16 eggs! That was fun! I found 16 eggs. I’m excited for the Bold Borders collection! Blooming is a great introduction! Love those bunnies and eggs! I counted 16 hidden eggs, in the hunt. Very fun! What beautiful products and inspiration! WOW! I counted 16 eggs! Found 16 eggs! Lovely projects & such a nice variety of styles? I found 16 eggs!! Made a list and checked it twice! Such a Wonderful start to this release!! I love all the spring stamps, dies and colors. So Happy and Fun!! Looking at the others, I don’t think I found them all, but I got 14. Beautiful projects, by the way! I also found 16. Love the new Easter Egg collection! I found 16 eggs. I’m loving all the springtime projects today! After many countings, 16 eggs. I found 16 very well hidden eggs! Easter egg hunts are so much fun for grown-ups. 16 eggs in total. I am just loving this release. The team did such an excellent job of showcasing so many different ideas. Exciting!!!! There were 16 eggs total. Beautiful projects! I found 16 eggs and lots of beautiful projects! Great job everyone! I found 16 eggs. I always love the egg hunt! 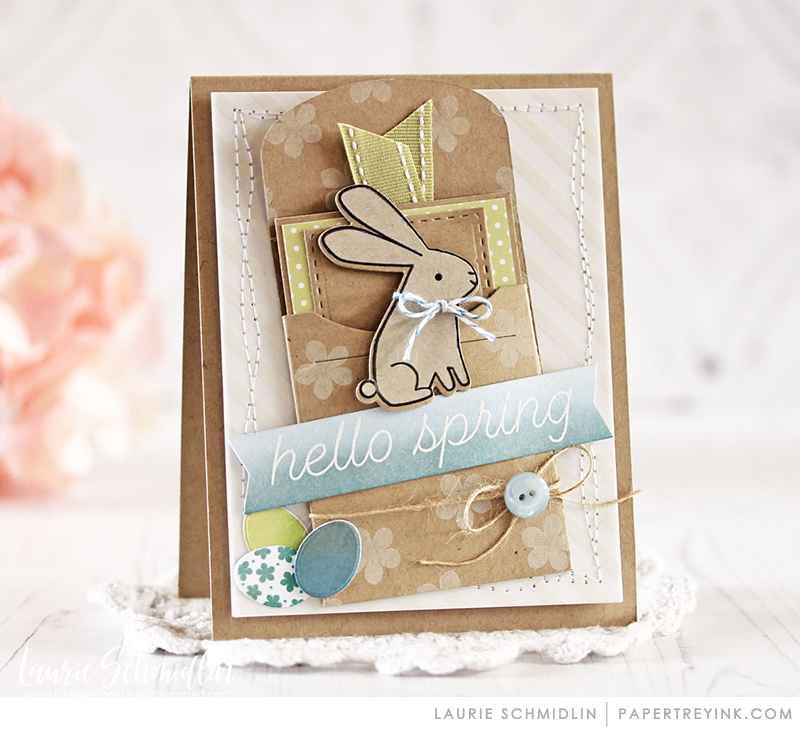 I love all of the Springy and Eastery goodness! The design team did an excellent job of making us ready for Spring! I counted 16 eggs in the egg hunt. Oh you ladies are so sneaky! I found 16 eggs (hidden very well!) among all those gorgeous projects! I found 16 eggs, you ladies make my morning’s fun! I love this challenge! I found 16 eggs. I love all of the Easter designs. They are so colorful and cheerful. My favorite colors are the pastels. Such a fun time of the year for card makers. I found 16 eggs. What fun!! 16 eggs! Those bunnies are so stinkin’ cute! I found 16 eggs among all the beautiful examples today. Makes me ready to do the real Easter egg hunt!?? Counted 16! This was my first time and SO much fun! Loved seeing all the ideas. I found 16 eggs. I love all the fun egg designs! I also found 16 eggs – some took several perusals to finally spot!! What wonderful projects today! I usually make very few Easter projects, but this year I think that will change. 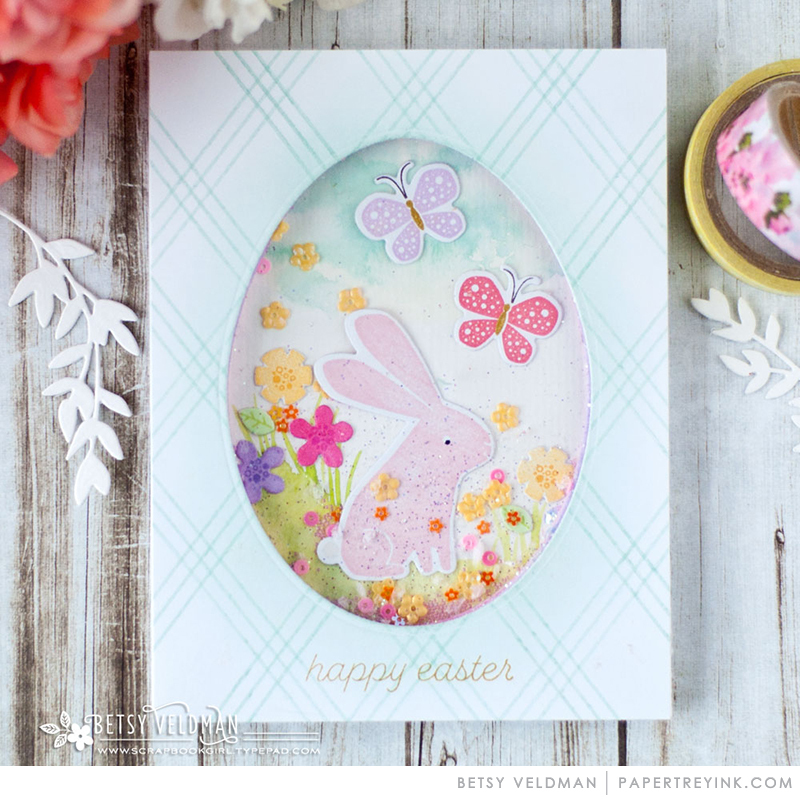 Betsey’s egg shaker card and all of the team’s Egg tags and other projects are simply delightful! Apparently I didn’t find them all since I only found 11. But I had fun! I spotted 16 eggs in my hunt. So fun, I found 16 eggs!! 16 in the egg hunt! Jump to all the fun. I found 16 eggs. So fun, and such beautiful projects! 16 eggs was my count. Love those striped eggs! 16 eggs! Love the Penned Elegance set. Lots of beautiful inspiration today. I think there are 16 eggs. I love the little bunnies and the eggs. I found 16 white eggs. Thank you for the blog tour of beautiful cards. Am making my list and checking it twice for February 15. 16 eggs! Love the inspiration. 16 eggs is my count. Great Spring inspiration! Welcome Jennifer…your word set is beautiful. Looking forward to each new day. 16 eggs! This was fun. I found 16 eggs in the beautiful cards. I found 16 eggs, I’m so glad they are still playing this game. 16 eggs – I always love the Easter release! So many beautiful images, sentiments, and colors on the projects! 16 eggs on my count…. I LOVE the Bunny Blessings set with all the add ons! CAn’t wait to get them all! Not sure what I loved more-the wonderful spring projects or the hunt. I found sixteen eggs in all and had a great time getting inspired for Spring. Super release! I love the cute bunnies! Oh and I counted 16 eggs! 16 eggs for me! Beautiful projects from the design team. The Big Egg is so cute as a tag and shaker card. Oh that was fun:) I counted 16 eggs! I get 14 hidden eggs. If there are more, they’re hiding pretty well! Aargh! I just saw the two I missed! Oh well, it was fun anyway. Fabulous inspiration by all! I count 16 eggs. I found 16 hidden eggs. Kudos to Stephanie for the cutest hiding place! I’m loving Penned Elegance. It’s going to be a classic and a must-have. So excited for all these lovely spring releases! Gorgeous inspiration from everyone! And how wonderful to welcome Jennifer as a new product designer too! Love these pretty sentiments my dear! I had fun straining my eyes looking for eggs too! I couldn’t find any on Keeway’s photo but I think there are 16 total. I also managed to find 16 eggs hidden among the lovely Easter projects! Great job, ladies!!! I think i found 16! I kept “going off in bunny trails,” distracted by all the pretties! That was fun, I found 16 eggs. Love this challenge every year! I found 16 eggs (Lizzy: 2, Laurie: 3, Betsy: 4, Heather: 3, Keeway: 0, Melissa: 1, Stephanie: 2, Michelle: 1). Thank you, Papertrey. I found 16 very difficult to locate eggs. However, each new project brought the color and hope of Spring so it was totally worth it. Fun egg hunt. I found 16 eggs. I found 16 “hidden” eggs among all the gorgeous creations! 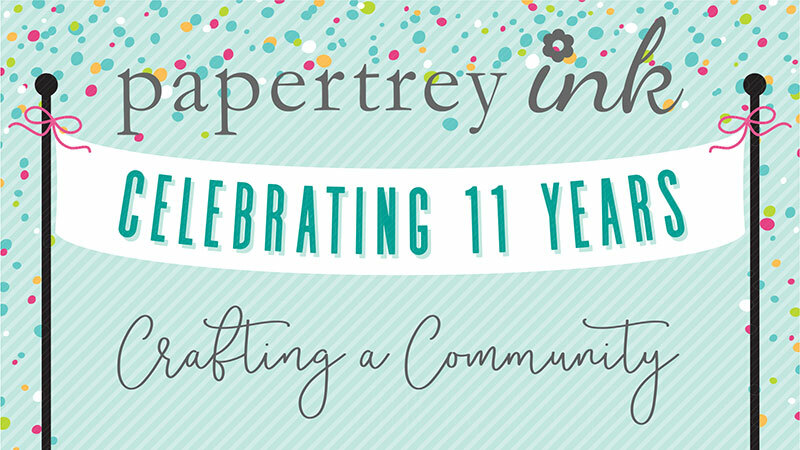 Thanks for this fun contest and the chance to win a Papertrey Ink gift certificate. I am looking forward to more great projects featuring the new release! I only found 15 eggs, but I did find a 8 lovely cards! I found 16 eggs also! And lots of pretty spring inspiration! Perfect for a snowy day! Almost missed one of the eggs hidden in Heather’s post but I found it! I found 16. 16 eggs. What a great distraction at the volleyball tournament! I’d much rather be checking out the fun eye candy than the games LOL!!! You gals are sneaky, but I did manage to find 16 before even looking at the posted comments. This would have spoiled the fun for me if I had seen other answers in advance. Maybe next time have a form to fill in like the sneak peek contest. Just my two cents! I found 16 eggs in total. Great to see some new products today – lots to get excited about. I found 16 eggs. Are the egg graphics larger this year? If so, in several cases it made them blend into the background more, and harder to see! Thanks for all the lovely inspiration, and for the chance to win great prizes this week! I tried and tried to find 16 eggs, as lots of people above said they found that many. But as much as I tried, I only found 15. Penned Elegance looks amazing!!! And all these springy colors make me long for spring weather!! Can’t wait for the rest of this release! It took some extra look-see but I finally found 16 egg images. Great inspiration for the first day, looking forward to the release. I found 16 eggs, and all of the projects are stunning! Love the new bunny and eggs for Easter. How adorable!! I found 16 eggs in the photos. Lots of beautiful projects that make me long for spring to arrive! I also found 16 eggs before looking at the comments. Loved all of the cards. Wow – I only found 13. I must have missed a few. 16 eggs total. Looking forward to the set that has the lily of the valley in it – noticed there was a sneak peak to it in a project today. Fun egg hunt…thanks! I think I found 16 eggs in all the teams photos today. Fun contest and thanks for the opportunity to win. Bunny Blessings is a sweet little spring/Easter set. 16 eggs hidden amongst some gorgeous designs! Great job, team! I found 16 eggs. Beautiful spring projects! The release is off to a great start! Sixteen (16) eggs were spotted hiding around some delightful projects. The large egg die is my surprise “I didn’t expect to like it as much as I do” product today; though, it might be the Egg Stripes that bring it to a special place more than the actual die. Fabulous start to your twelfth year in business. I found16 eggs! Wonderful projects from the designers. Happy Easter Egg Hunt…there are definitely 16 eggs hidden! Fabulous projects as well! I counted 16 eggs in total – beautiful work ladies! I’m very excited for the release of Penned Elegance! Lovely projects! I spotted 16 hidden eggs. FUN! I found 16 eggs. Some of them were very cleverly hidden. Very excited about this release. Now that’s my kind of Easter egg hunt! The projects are so beautiful and creative. I love the new products and I’m enjoying the anniversary festivities very much. I found 16 ! Some were not easy to see but they were all hidden in such beautiful projects! Well, I forgot to give my egg count. I also counted 16 eggs. I counted 16–hope this is correct! This was really hard but I think I saw 16 eggs. That was a fun egg hunt! I found 16 eggs. Loved all the projects too! II got sixteen eggs too! Beautiful projects hiding 16 eggs! Love your anniversary ideas and fun! So many cute projects! I spied 16 eggs. Bunny Blessings + Big Egg + Egg Stripes = LOVE! Counted 16 eggs. Hope I can count correctly – 16 in total, fingers crossed! Thanks for sharing sneak peeks! Finally found 16, had to count twice. Lovely projects! I found 16 eggs on the egg hunt photos of the beautiful projects presented today! So fun! I found 16 eggs! Such a fun hunt! Love all the new Easter products introduced today! 16 eggs … I am loving the Easter inspiration! I counted 16 eggs. It took me a couple of tries to find them. Hope that is right. I found 16 eggs. Thanks for all of the Easter inspiration. I like the big egg die and stamps! I counted 16 eggs in the photos. 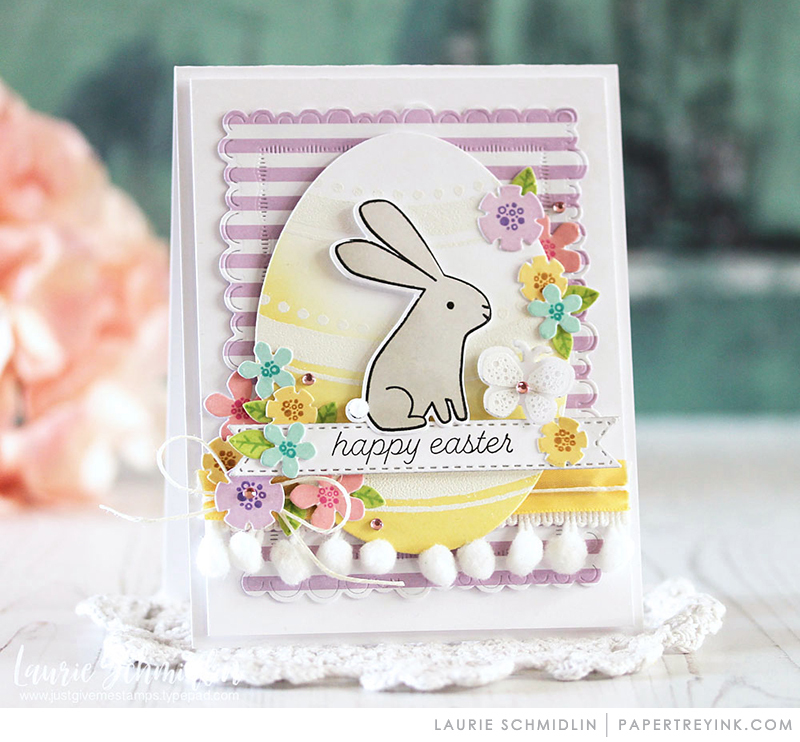 I love the bunnies and eggs–especially Laurie’s egg tags! Adorable! I found 16 eggs. I found 16, too. If the next 4 days are as wonderful as this first day I may need to take out a second mortgage! Easter items are wonderful! I spied 16 eggs in total. This is always such a fun way to go around and look at everyones projects. Thanks for the beautiful inspiration. What fun Easter themed products. I found 16 eggs. 16 easter eggs! This is my favorite anniversary challenge. I think that “big egg” is super. I found 16 eggs. So many beautiful cards! Almost messed up. I counted Betsy twice. Good thing I checked. I came up with 16. I had fun searching. The Easter Egg hunt was so much fun! Some of the eggs were cleverly hidden. I found 16 eggs. I also enjoyed seeing all of the beautiful Easter cards. This was a challenge, but a fun one! I found 16 eggs! 16 hidden eggs. Today’s cards and tags have me longing for Spring! Everyone’s creations were super cute! I found 16 eggs on my hunt. I spied 16 eggs in all. Can’t wait to get hold of the Big Egg die! For once I seem to be on the same page as most others. I found 16! Love the Egg die and Egg Stripes! How fun! Love the egg hunt! I found 16 eggs. Wonderful projects by the team! I found 16 eggs in the photos. My 5 year old son & I had fun doing this together. He was really good at spotting them. We found 16 total. I found 16 eggs, and a new love for Easter related crafts! Love that new large egg die used as a tag. So cute! Whew! My eyes are crossed! Lol! I ended up with 16 eggs. I hope that’s correct because my eyes can’t see well enough to count again. I found 16 eggs. There’s a big difference between looking for them on my phone vs. my desktop! I always look forward to the egg hunt, and of course, the great inspirational projects! First go around I only found 14 but after reviewing the images again I found 2 more. So my total is 16. Great job everyone. I spy 16 of those little eggs. I love the anniversary egg count! I found 16 eggs. Found 16. Pretty bunch of cards! Thx for a fun challenge! I found 16 eggs. Some of them were sooo tricky! I’m going with 16 eggs. I almost missed one of them!!! 🙂 I love what you’ve shown us so far and can’t wait to see more. 16 eggs. I love the borders die! Yup, yup…I count 16 eggs! Love the little bunny and Easter goodies. There are 16. Some tricky ones in the tulips and on the lace! This is so much fun – I counted 16 eggs. My daughter and I counted 16! Good thing she helped because I missed a few she spotted! Thanks for a fun challenge! I love doing this every year – you guys made it harder this year!!! I hope I am right when I say I counted 16 eggs. My eyes are buggy! I found 16 eggs and a lot of inspiration! 16, and only 1 grandchild . . . .is beyond that age =) love the release, love my grands!! I found 16 eggs too. Lovely projects. I found 16 white eggs. I think there are 16 eggs. That large egg die is really lovely. Beautiful projects! I counted 16 eggs. makes me wish spring would hurry and get here soon! I found 16 eggs. Hard not to be distracted by all the beautiful projects! This was a team effort that required young and old eyes. We counted 16 eggs across the blog posts. This was a fun exercise. Very sneakily hidden eggs! My poor eyes! Looks like 16 it is! Love the Big Egg die and stripes. I found 16 eggs and enjoyed looking at all of the card samples. My favorite was Laurie’s white embossed card. Thanks! Fabulous projects today! I found 16 eggs while going through the sites. I love this time of the year, Spring, Easter, all the pastel, love all the beautiful work! My answer is 16! I found 16 eggs! So fun! Fabulous new products! Your design team really showed off today!! Love the Bold Borders! I found 16 hidden eggs! Amazing inspiration as always! I counted 16 eggs, many very well hidden! I found 16 eggs as well. Some of them were pretty sneaky! These are awesome! Love the eggs! I counted 16 eggs, thanks for the fun! I counted 16 eggs! I loved all the spring I saw! Love the big egg die! I found 16 eggs on my Easter Egg Hunt! I counted them several times and came up with 16 eggs. Several were very sneakily placed! Had to count twice to finally see 16. 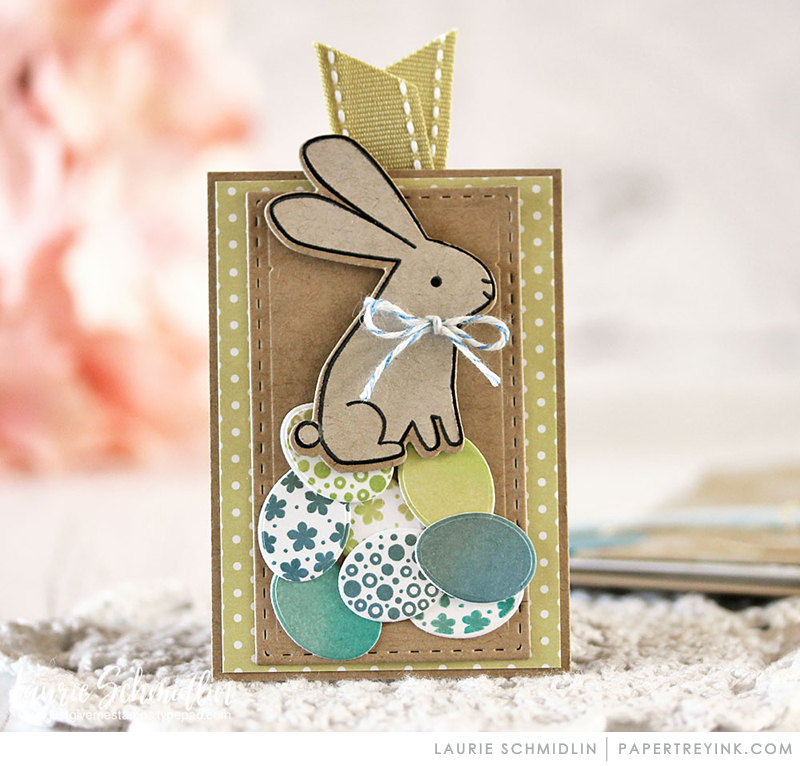 Laurie knocked it out of the park with her Bunny Blessing card and her Big Egg striped monogram tags !!! So excited to see the rest of the anniversary release !!! My count is 16! Love the Easter egg hunt! Love the Easter projects! I spied 16 eggs! Always a sign of spring to come. 16!! What a fun activity. There are 16? That was fun! I found 16 eggs! Love all the cards today, but the bunnies stole my heart ?. I love spring! I counted 16 eggs. Beautiful projects and great new products! I counted 16! I am loving all of the projects! I LOVE the bunny image! 16 eggs! I found 16 eggs. Love all the Easter inspiration today! Always love the search. 16 for me. I love doing this every year! I got 16 eggs! I found 16 eggs today. I almost missed one on Heather’s. I decided to scan them back and forth, as if reading line by line. Anyways, I hope I found them all, I got 16. Some of my fondest memories is Easter hunts as a kid. And as an adult it was so fun to do one again! Loved it. I got 16. I found 16 eggs. Love this contest! 16? This egg hunt made me feel like a kid again! I counted 16! How fun. That little bunny is precious and love the new egg-shaped die! I counted 16– I had to squint at some of them. I found 16. I was through 4 blogs though before I found any! Eyes are getting older, had to go back through. I found 16 after numerous times of checking! I have always loved this challenge! I always look forward to this contest every year! I counted 16 this year hidden amongst all of the lovely projects! So many fun Easter products & projects! I count 16 eggs. Yep, 16. my old eyes hurt! lol! I found some beautiful inspiration and 16 eggs. I found 16. A few were hidden really well. The projects are so pretty. 16 eggs I counted! Love all the projects — such great inspiration! Can’t wait for this release! Fun challenge and beautiful projects! I saw 16 eggs. Lizzie – 2: Laurie – 3: Betsy – 4: Heather – 3: Keeway – 0: Melissa -1: Stephanie -2: Michelle -1. All beautiful cards with some very well hidden eggs! I found sixteen in total. Thank you for a fun blog hop and the chance to win! I found 16 hidden eggs. Such cute products today. for the eyes! So 16 it is. 16 eggs – very well hidden. What a fun task! This is a terribly hard challenge for people with bad eyes! I found 16 eggs. I love the new sentiment set. It’s lovely! I found 16 eggs and If I win it would be even better than the chocolate eggs I get for Easter! 16 eggs, lots of fun inspiration along the way! All the projects are so fresh and happy and make me yearn for spring! I love doing the hunts and it was cool to see all the wonderful projects and I found 16 eggs. 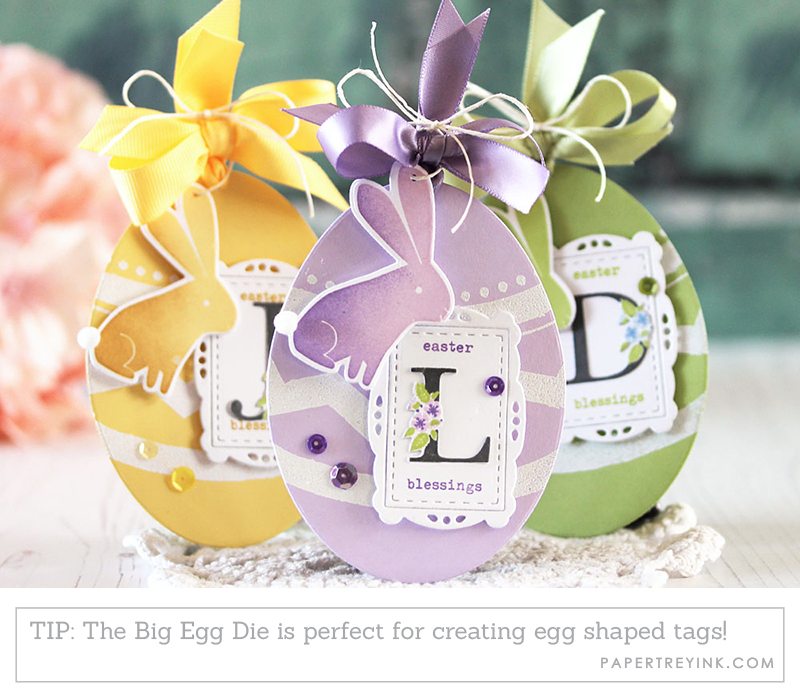 Love those monogrammed egg tags! I found 16 eggs. I love all the Easter cards. That little bunny is so cute. I believe there are 16 total hidden white egg images. I enjoyed searching for them, but my eyes aren’t what they used to be, so I hope I didn’t miss any while I was admiring the beautiful cards. Thanks for the inspiration. I found 16 eggs! I love that Penned Elegance has matching dies! That was tough, I got 16 eggs! 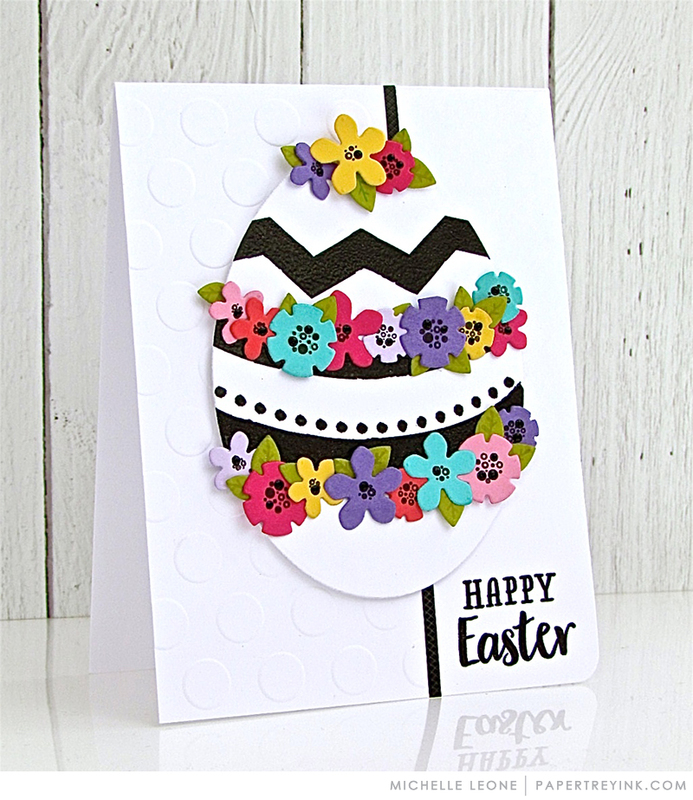 16 delightful eggs…such colorful and fun cards in this egg hunt post! This is always such a fun challenge! I counted 16 cleverly hidden eggs! Thanks for all the lovely creations today! They were as wonderful as ever!!! I was able to find 16 eggs. The new Penned Elegance set is a must-have. And the bunny is adorable! 16 – some very tricky this year! I found 16 eggs, plus lots of glorious inspiration! 16 eggs! Counted twice to make sure! I found 16 eggs! There were a couple tricky ones. 😉 Fun game every year! 16 eggs. Thanks ever so much for the chance to win! Happy anniversary! 16 eggs. Great projects by the design team. I found 17 eggs. Win or lose this is one of my favorites of Anniversary month! Just lovely cards and tags. Full of color and inspiration! Happy Anniversary! I counted 16 eggs as well. Love, love the eggs and bunny stamp set! I found 16 eggs, but there is always a hard one, so hope this right. Have a great day. These cards are beautiful that I forgot to count eggs on some and had to go back and double check! I counted 16! Ok, so I found 20 eggs but 4 of them were on the smaller picture of Betsy’s card introducing her blog. Do I include these four or not? I’m going with 16 saying the smaller photo isn’t the official blog photo. I found 16 eggs, with the most on Betsy’s blog and the fewest on Keeway’s. 16 cute eggs! Love the hunt every year! Whew, I found 16 eggs. Hope I did’t miss any! Thank you for all the great ideas! I found 16 eggs. It’s silly fun but I look forward to this “hunt” each year! Thank you for reminding me of the importance of visiting designers’ blogs to get more detail and information on their projects. I found 16 eggs. The projects the DT made are gorgeous. Such a fun egg hunt. Fabulous inspiration on the blogs of the members of the design team! I believe there are a total of 16 eggs. I had trouble last night trying to leave a comment for this challenge. I think there was a server problem. If you are accepting late entries then here is mine. I guess 16. I enjoyed the challenge. Harder than you think. I kept going back to the same picture by mistake. I guess I should be asleep instead! What a fun challenge! I counted 16 eggs. I found 16 eggs! Many beautiful projects! I quadruple-counted 16 eggs in total throughout these beautiful projects. Love all the beautiful cards for Easter! The egg hunt is always so much fun – you really get a good look at each project while looking for the eggs, of which I found 16! I spy 16 eggs. Thanks for the chance to win! These products are just gorgeous! 16 eggs – what a fun challenge! I counted 16 eggs in total. This is just so much fun every year! Cheers. Soo fun! I counted 16 eggs tooo. 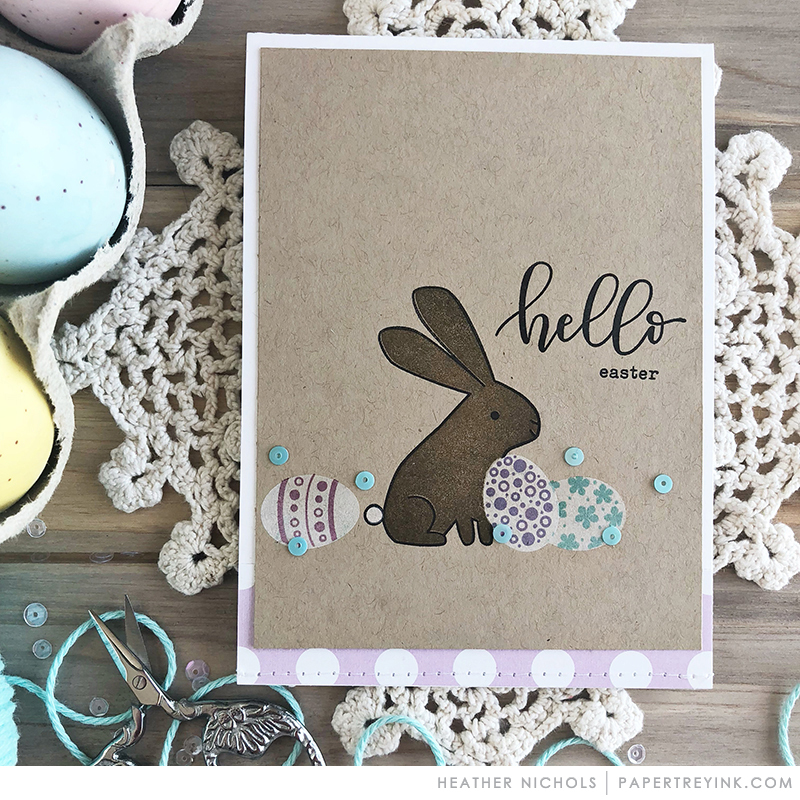 I just adore the stamps Heather creates and this bunny and eggs do not disappoint. A must have for me. I found total 16 eggs~!!! PS. I just love these bunnies and eggs!!! I am so looking forward to spring. My favorite time of year. Great job hiding the eggs. An Easter Egg hunt is always fun! 16 eggs. Such a fun Egg Hunt! I found 16 eggs, and lots of card ideas for Easter! I found 16 eggs, too. My son and I counted 16 eggs! Love the Egg Hunt! I found 16 eggs in total, LOVE this egg-hunting game! Always look forward to have it during the anniversary celebrations! Thank you for inspiration and fun! I counted and counted again… and verified I saw 16 eggs. Thanks for the fun start of my Day! 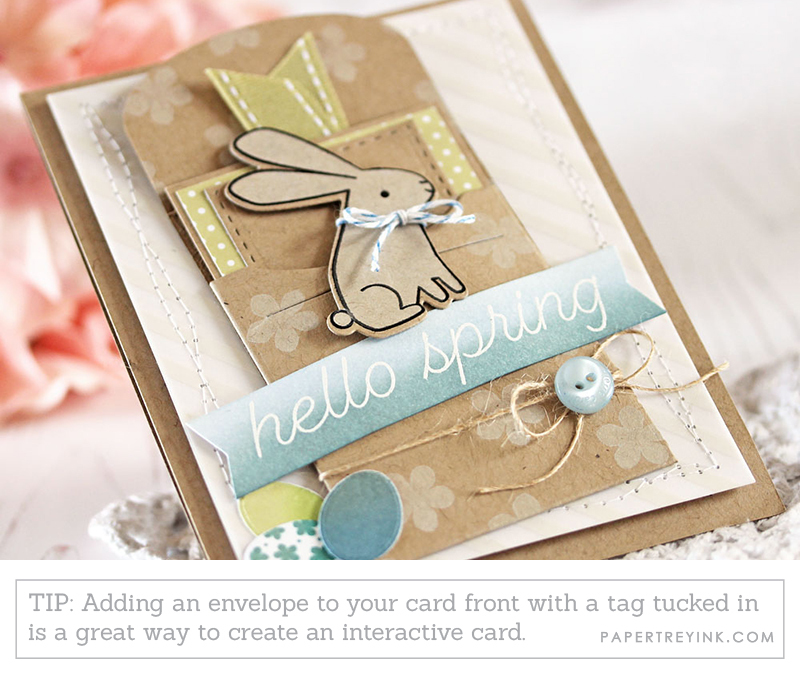 Love seeing all the springy cards! I found 16 eggs in total! 16 eggs! So many cute projects! I found 16 eggs 🙂 What a fun way to kick off this year’s anniversary release! Can’t wait to see what PTI has in store for the year. Found 16 eggs…always enjoy this Anniversary tradition! Can’t wait for Thursday! I count 16! What fun! I counted 16 in all. Such fun projects today! I love Easter & can’t wait to try some of these awesome new goodies. I counted 16 eggs & sure hope that’s right! I spy 16 eggs! I look forward to the Easter egg hunt every year! I love the egg hunt Challenge! I found 16 very well hidden egg watermarks. (I have to say the ones on Stefanie Gold’s photo were quite tricky to spot). But oh, what a fun Challenge! I believe I spotted 16 eggs! That was fun! Difficult – but fun. I found 16 eggs. I counted 16 egg. ? Happy 11th Anniversary! Whew! Yes I counted 16 eggs. I don’t know why I had a hard time finding some of the links so it took me longer to find the photos than to find the eggs! hahahaha! Love the penned elegance and the blessed bunnies. I found 16 eggs! Whew!!! I counted 16 eggs as well – Once I got my glasses on! Love participating in this hunt every year! I spotted 16 eggs. Great projects from the design team. Heather always has the best little characters!! Love Bunny Blessings!! I found 16 eggs. I found 16 eggs and lots of beautiful cards! I THINK there were 16 hidden. I KNOW I loved all the eggs and bunnies! I found 16. I just love this time of year! I found 16 eggs and enjoyed looking through all the beautiful cards for them! What a fun egg hunt! Not an easy task to find them all but I think I’ve got them. 16 in total. Finally have wifi fast enough to get a look at the pictures! I count 16 eggs. Sixteen sneaky white eggs! Love this game every year! So many beautiful projects! 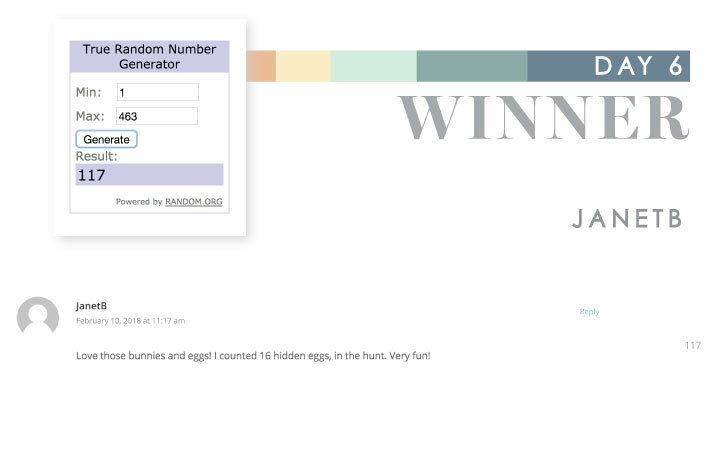 I found 16 eggs – thank you for the chance to win! I finally figured it out & found 16 eggs. Definitely a challenge. The Bunny Blessings are so very cute! 16 little eggs hidden in so many beautiful cards! Beautiful release! I spy there are total of 16 eggs. Such soft, sweet colorful projects today! Beautiful projects from the Design Team, as always! 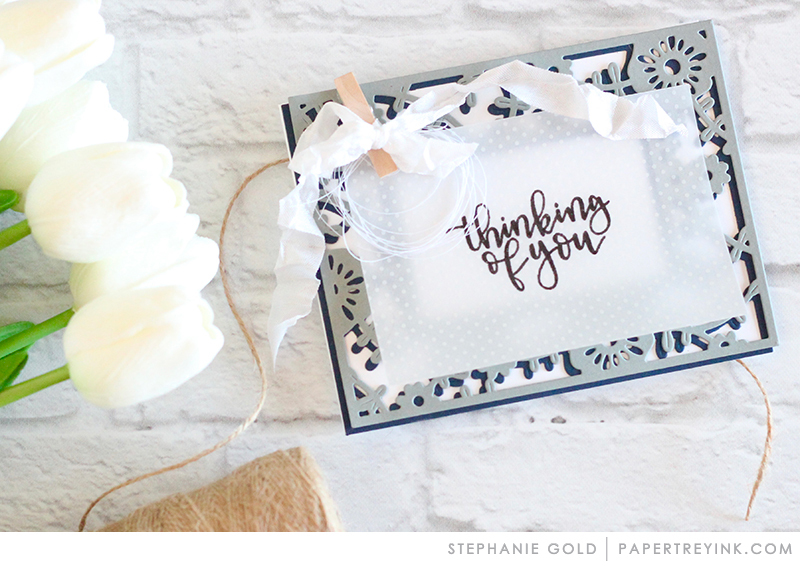 My favorites from today’s post: the Penned Elegance stamp and die set. I also love the egg-shaped tags by Laurie. Awesome release! Love this time of the year!!! I counted 16. Great February posts! These projects are gorgeous! Such inspiration – I am wishing for spring. I counted 16 eggs. A fun hunt! I found 16 eggs hidden in the photos. Thanks for the great projects. This bunny and large egg are adorable. So many fantastic projects. I counted 16 eggs. Love the new products and all the beautiful projects! On my Easter Egg Hunt, I found 16 eggs! I counted 16 eggs! Gorgeous projects! I found 16 eggs in all! What fun!! And so many gorgeous projects and amazing products too!